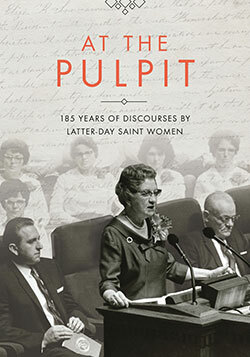 At the Pulpit, published in 2017, contains fifty-four discourses given by Latter-day Saint women throughout the nearly 200-year history of The Church of Jesus Christ of Latter-day Saints. Introductions and annotation provide insight into the biographical, historical, theological, and cultural context of each talk. In addition to being a scholarly history, this book provides a resource for contemporary church members as they study, speak, teach, and lead. At the Pulpit contains fifty-four discourses given by Latter-day Saint women throughout the history of The Church of Jesus Christ of Latter-day Saints. Like Lucy Mack Smith, these women drew on inspiration and experience to declare their understanding of eternal truths. This book illustrates the history of women’s public preaching in the church, but its most important feature is the actual words of Latter-day Saint women. From the time of Emma Hale Smith’s earliest exhortations at meetings of the Nauvoo Relief Society, Latter-day Saint women have been charged to instruct their families and neighbors, their congregations and Relief Societies, and other organizations. The talks featured in this volume show Latter-day Saint women doing the spiritual and intellectual work inherent in a life of Christian faith—seeking to do good works, understand the atonement of Jesus Christ, and strengthen their own faith and the faith of those around them. These women endeavored to live what they believed and to help their listeners do so as well. Written to the high scholarly standards of the Church Historian’s Press, this book provides a resource for contemporary Latter-day Saints as they study, speak, teach, and lead. Each discourse in this volume begins with an introduction that acquaints readers with the vibrant personalities of some of the women who have shaped the church. Introductions also provide glimpses into the circumstances and forces that shaped these women. Readers will encounter some familiar figures from church history and from the contemporary church—leaders like Eliza R. Snow and Linda K. Burton, current Relief Society general president. But they will also learn from women like Jane H. Neyman, whose stories are largely unknown to modern Latter-day Saints. Neyman applied to join the Nauvoo Relief Society in 1842, but her petition was rejected due to gossip about her daughters. Over twenty-five years later, she spoke in a Relief Society in Beaver, Utah, on charity, urging members to be forbearing and forgiving of one another. The voices in these pages ring from Nauvoo’s red brick store to the National Auditorium in Mexico City to the Tabernacle on Temple Square and beyond. These discourses offer instruction on gospel principles while also revealing the particular concerns of individual women. At the Pulpit allows us to hear the historical and contemporary voices of Latter-day Saint women—voices that resound with experience, wisdom, and authority.